Solutions are high level descriptions of data refining services that can be published in the marketplace even before actual implementation. When a solution is implemented, released and made available by launching a sales campaign it becomes a concrete data refining service that can be purchased in the marketplace and accessed under the terms specified by the campaign. 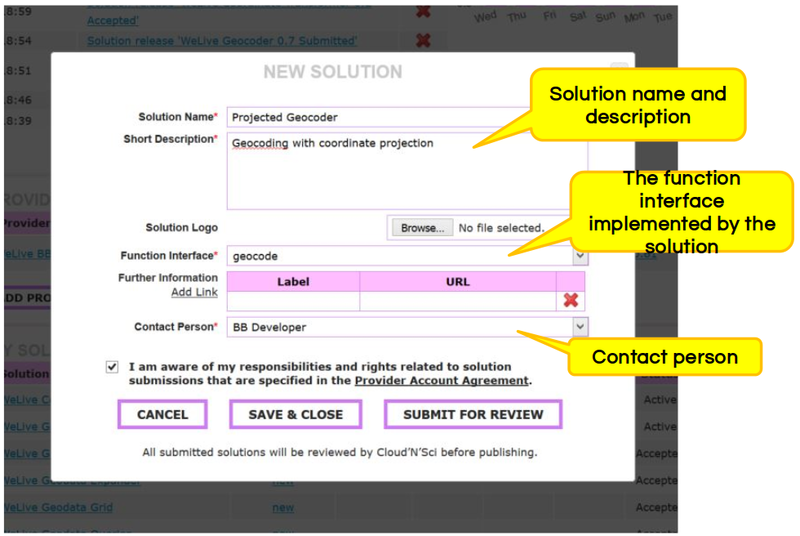 Submitted solution information must include a name, short description and a link to a function interface which specifies the usage instructions. Optionally, solutions can also have a logo and links for further information or demos. Providers are highly recommended to re-use existing function interfaces whenever possible instead of writing their own. Solution summary page contains relevant information and useful links for the solution. Here you can also view available campaigns and prices and buy a contract for the solution. Active campaigns for the solution. Here you can see available versions and prices. You can also buy a contract for the solution. My Solutions can be found on your My Business page. Here you can create and release new versions and create campaigns for your solution. New Solution can be created in your My Business page. Further Information - Links to additional information etc. Data Refining Solutions can be found on implemented algorithms summary page. This is a list of solutions, that implement the selected algorithm.